The success of the Switch surged to new heights in 2018. Throughout the year we heard about the ongoing sales of Nintendo's hybrid system and how a number of first-party titles broke records and sold out at launch. 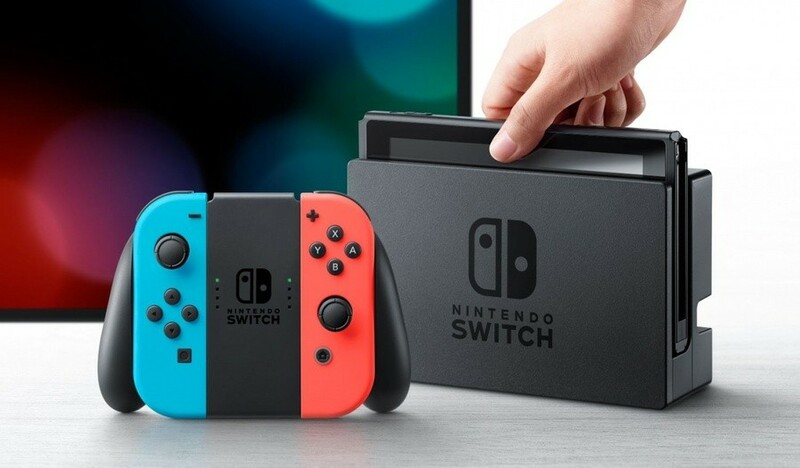 According to data from industry-tracking firm The NPD Group, the Switch was officially the best-selling games platform in the US last December and throughout 2018. The system did so well, it not only outsold the PlayStation 4 and Xbox One, but it also managed to have the best December of any system this generation. "Nintendo Switch generated the highest December month hardware dollar sales for a single platform since the Nintendo Wii in December 2009, and achieved the highest December unit sales for a single platform since December 2010. "Nintendo Switch ends 2018 as the year's best-selling hardware platform in both units and dollars. Annual unit and dollar sales of Nintendo Switch are the highest annual total for any hardware platform since the PlayStation 4 in 2015." "Console hardware unit and dollar sales reached their highest annual totals since 2009." Gaming accessories also had a 29 percent increase in December 2018 compared to the previous year, reaching $1 billion. The Switch Pro Controller was December's best-selling accessory in terms of dollar sales. Are you at all surprised the Switch was the best-selling system in December and throughout the year in the US? Tell us below. @Spidey-Scrub "But I thought they were Nintendoomed 🤔"
And yet, there are people who will try to spin this as negative news for Nintendo. And some were saying 2018 was a weak year for Nintendo. Imagine how 2019 will be with the already confirmed games. Switch is absolutely unstoppable. Great to see Nintendo on top again. Congrats to Nintendo for achieving these numbers and proving all the haters wrong! Good to see them back on top. So happy for Nintendo, these are great news for the company and the videogame industry in general. Gaming in general seems to be doing pretty well. At least for Nintendo, Sony, PC and smartphones. All of those had significant successes that I heard quite a bit about. Meanwhile I sometimes forget Microsoft has a console on the market. I know its utter failure in Japan isn't a universal thing, but I can't recall if there was a single Xbone exclusive that I heard about last year. There must have been something though. Right? No idea how many times it needs to be proven... Big shinny new games move hardware in the USA. Not rehash or random indies. Fact that PS4 was leading the Switch in Unit sales coming into December makes it even crazier. Keep the big games rolling. Excellent. But it shouldn’t be a sharpies. Terrific hardware and a very strong library of games matched with good marketing. Nintendo’s library building tactic has been spot on. Buyers went into shops in November/December and saw an attractive Nintendo system with Smash, Mario, Pokemon (plus spin off), Mario Kart, Zelda (plus spin off), Donkey Kong, Kirby, Splatoon, a Mario Sports game and a decent B Tier (Captain Toad, Xenoblade, Bayonetta 2). It has loads of family friendly games and then this was backed up by portable versions of Diablo, Skyrim, Doom, Civilisation, Monster Hunter, Wolfenstein, FIFA, NBA for those adults already tempted by ansustem that fits into their grown up lives. Then of course there are big Online names like Fortnite, Rocket League, Warframe and Paladins. Nintendo have hit the nail squarely on the head. Yeah, but Microsoft getting those first party studios under their belt recently has me intrigued. Not that I'm going to get an Xbox or PlayStation next gen, sticking firmly with Nintendo/PC, but I hope Xbox does better than PlayStation next gen because I'm pretty tired of the Sony fanboys acting so smug. I love it that those two consoles keep switching places every generation. PlayStation 2 was bigger than Xbox, Xbox 360 was bigger than PlayStation 3, and now the PS4 is bigger than the Xbox One. I love rooting for the underdogs and find the whole PlayStation vs. Xbox thing amusing, especially since they're both just weak bootleg PCs with way less options. @Frenean that's like chucking three deckchairs off the Titanic at this stage of the game though, no? Those PS4 and XBO numbers are truly pathetic. It is easily the worst December month ever for both consoles - even worse than in December 2013 when both consoles had just launched and were somewhat supply constrained. The PS Classic sold less than the NES Classic in December 2018. Combined that with records low PS4 sales during that same month, and you have a mediocre, if not flat out bad month for PlayStation in the US in December 2018. @Heavyarms55 Don't rule out Microsoft for the future. Their work on cross play and backward compatibility and all the studios they have been buying of late makes me think they could have a very strong comeback. Just think, you have a XBOX and a PS4 now and you need to buy the next gen console. you could come with the choice of buying the PS5 with maybe one or two launch titles or you can get a new xbox and keep playing all your old games still also (which means you could sell your old xbox and get some money back to reduce the initial costs). What microsoft is working on is customer binding. once you have one of their consoles they allow you to keep playing it on any future console and that is something Sony and Nintendo can really learn from. Personally, i am not sure which next gen console i will get once they come out but i was firmly on Sony but that is starting to change a bit (they do have the best exclusives still so we do need to get some news on that from MS front). It really does have a fantastic library of games to choose from. I’ve had my Switch since day one and I’m a regular reader of this site and others so I’m always aware of new games coming out, when they release etc. However I was in Smyths at the weekend and I was quite simply taken back by just how many Switch games they had to choose from. There was quite literally 2 full isles of games specifically for the Switch. In the dark days of the Wii U we’d be lucky to see more than a shelf or 2. @Drussa I don't have anything particularly against any console. I don't buy into the whole "I hate this console, my favorite is so much better!!!! ARAGSFADSAF " nonsense. My thing is, what major new games, exclusive to their platform, were big last year? For Sony it is easy, Spiderman and God of War were hugely popular. It's even easier for Nintendo, with titles like Pokemon and Super Smash Bros. But I can't even find good lists for the Xbox. Not saying it is a bad device at all, but when the vast majority of your games are also on other devices, and those devices also have exclusive titles that your device lacks, it's gonna be hard to compete. I kinda feel like Microsoft is competing with itself at this point. With almost all of their best selling titles on PC as well. Specifically, on Windows. And I suspect one of their last holdouts, Halo 5, is purely to help protect their Xbox brand. If Microsoft wants to keep producing game consoles, they really need to release more exclusives, but in doing so, they are hindering their own potential PC profits. Personally if I were Microsoft, I would be looking for a way to release a Windows PC software package that allows one to play their back catalog on PC and focus all future game development onto PC, the platform where they have much more dominance. No one can tailor make games for Windows better than the very people who make Windows after all. Yeah that difference has struck me too. My local Asda for example. That chain stopped selling Nintendo at all for a while when Wii U flopped but I was in my local one yesterday and the Switch section has doubled in size at the expense of the Xbox bit. My local Sainsburys has a big Switch display at the front doors in the 2 weeks before Christmas. For all the move towards digital, what buyers (especially the mass market and Christmas shoppers) see on the shelves is important. What do punters want from a Nintendo system? The Nintendo big hitters, and lots of them were on the shelves. The mass market doesn’t care whether they’re Wii U ports and Nintendo were very clever using them to bulk up the library. Then there’s the variety offered by third parties and those shelves look great, it looks like a fantastic Console. As you say compared to Wii U it’s night and day. @Heavyarms55 as far as I know Xbox had 3 console exclusives last year. Is there somewhere we can see the actual numbers rather than these vague "best X since Y" statements? Same as my local Tesco store...the Switch is in stock as it sells well..they never even had a Wii U in sock. Where's "Cobalt" when a article like this comes out?. He would still manage to spin the news in a negative way. The Switch sold 1.77 million consoles in the U.S in December. @Heavyarms55 The X box ONE x is a beast of a console and is where I play all my TV multiplats right now. I think it has gone some way into rescuing them this gen. They will not catch PS4 and it will take they a while to rebuild their studios after they pulled down the shutter at the start of this gen but they seem to have set themselves up ok to compete again next gen. We all win when there is more competition. And its great to see Nintendo back in the mix. @johnvboy He’s been missing for a while now... not that I miss him in the least. @BarFooToo Like I said, I have nothing against it. But it lacks exclusives, and competes against their own other products. I just don't see much benefit to a a console that both lacks a significant number of exclusive content and doesn't deliver a different experience from other consoles that have it. Even if the hardware is very good. Software is what sells a device. Competition is very good for everyone. When there is actually competition. Functionally I could never see much point to ever owning a PS4 and an Xbox 1. The PS4 has many great exclusive titles, VR and PS Move. Xbox One matches it graphically, with only minor differences, but has far fewer exclusive titles, and lacks a gimmick. Its only real saving grace in my opinion is its backward compatibility, but even that is limited. Switch on the other hand offers a totally different product and experience, so a PS4 and a Switch make sense. Gaming PCs are still notably more expensive than game consoles, so I don't think consoles are going away anytime soon. But that price gap is shrinking. Next generation is anyone's guess. We can't really base how a company will do with their next product based on their current one. Look at Nintendo. Things were pretty bleak during the Wii U era, but now that we have the Switch, clearly things have changed for the better. The PS2 crushed the Xbox, but then the 360 crushed the PS3 despite the 360's glaringly high malfunction rates. Then PS4 dominated Xbone. So it is really anyone's guess what will happen in the next few years. @Heavyarms55 I own a PS4 and XBO. The PS4 mostly for exclusives and Japanese support. The XBO for backwards compatibility and for how stupidly cheap Game Pass is. @Mrtoad where did you find that 1.77 million number? I haven't seen that anywhere. I love how the Switch is earning an "Exceeds Expectations" to "Outstanding" in all its O.W.L.s right now. Good to see, and I bet we'll see the same thing this year with the Switch hitting it's stride as the PS4 and XB1 head into their final years. Overall though, the industry appears to be in a healthy position with all 3 consoles having some form of success. Never underestimate Pokemon and Smash! The Switch will be bigger this year thanks to more blockbusters. @Heavyarms55 I guess I'm one of the few who find the play anywhere feature as smart for Microsoft and Xbox in general. I pretty much view the Xbox One as a stepping stone to Microsoft's next console sorta like the Wii U was to Switch. December 2009 was also the holiday month after New Super Mario Bros. Wii released, which rocketed the Wii to sell more units that month than the PS3 and X360 sold that entire year, I remember reading. For those that are questioning the reality of multiple Switches per household, I remind you that in the US, our economy is the best it's ever been in decades. Wages are actually increasing, a first in a VERY long time. @Heavyarms55 Microsoft is going for a "play anywhere" platform strategy, so it makes sense that most MS games are playable on Xbox and PC. Some people like PCs, some people like consoles. For a long time MS has had Halo, Gears, Forza, Crackdown and timed exclusives like PUBG. Some other interesting exclusives like (Rare's) Sea of Thieves, and the upgraded version of Final Fantasy XIII. Xbox also has a large back catalog of 360 and original Xbox games, as well as basically all current-gen cross-platform games like Overwatch and RDR2, many of which are unlikely to come to Switch any time soon due to graphical requirements. And you're not stuck with the "pocket edition" of Final Fantasy XV. I guess the point is that Microsoft has built a pretty strong game ecosystem on Xbox and PC, and it includes many excellent games that aren't available on the Switch.